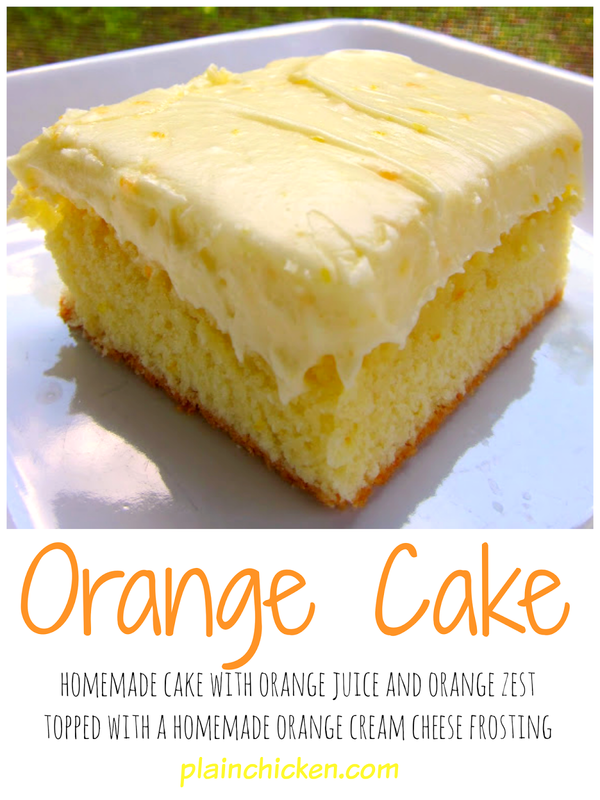 Orange Cake Recipe - homemade cake with orange juice and orange zest - topped with a homemade orange cream cheese frosting. My favorite cake! This cake is one of my all-time favorite desserts. I haven't made it in years because I can't control myself around it. It is very easy to make and has a wonderful orange flavor. This recipe is from Paula Deen. If there is one thing Paula Deen does well, it is desserts. She calls this recipe orange brownies, but I think that title is confusing since there is no chocolate anywhere in the recipe. This is a great cake for a spring/summer cookout. I'd like to experiment with other citrus flavors - lemon and/or lime sound good. I think that sounds like the perfect excuse to make this again! Cake: Stir together flour, granulated sugar, and salt in a bowl. Add butter, eggs, orange extract, and orange zest. Using a handheld electric mixer, beat until well blended. Pour batter into prepared pan and bake for 30 minutes, or until light golden brown and set. Remove from oven, allow to cool. Frosting: In a large mixing bowl, whip the butter and cream cheese together with a hand-held electric mixer. Gradually beat in the confectioners' sugar until it is all combined and smooth. Beat in the orange zest and juice. Spread over cake and cut into squares. I already had to squish into these britches I'm wearing today! I can see no control in my future either if I make this. I be's a Brownie mines seff, but I likes auwanges, too. This looks fabulous. Why does citrus always catch my attention? Unknown - yes. This is more like a brownie than a traditional cake. I imagine this tasting like orange creamsicles. Which is good! It looks delicious. That looks so yummy! I love Paula. And I love your new blog look! Holy smokes this looks good! Bookmarking this for sure. I am planning to make this great looking cake ASAP! Does this need to be refrigerated after frosting or is countertop in a cake stand with lid ok for storage? Brenda - we just covered it and left it on the counter. It kept for several days. I agree! Paula rocks the desserts. Looks great.